How did I almost click the link? I remember recently leaning that you can now send and receive e-Transfers by text. I run a business and get a lot of emails and texts, including e-transfers. I have had Bell phones in the past, and momentarily forgot I was with Rogers and not Bell anymore. I do watch my cell phone bills as they sometimes mess them up.But I had not looked lately. I almost clicked the link… then thought, hold on a second! Why I didn’t click the link! I almost never click something that can be a scam without doing some research on it. I quickly googled the phone number, it did not turn up for Bell in any way, but also it did not turn up as a scam. Just was mostly unknown is all. I thought, why would I get an e-Transfer? They usually just credit your bill. 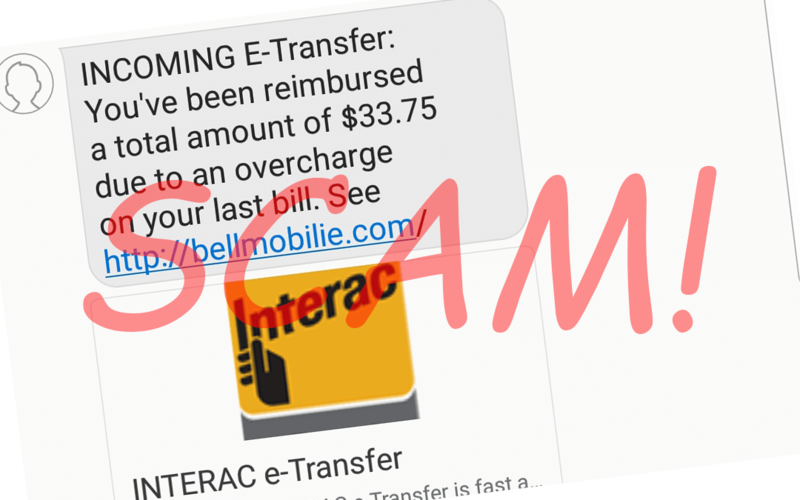 Then I looked up “Bell E-transfer scam” and found lots of info that there are scams like that to watch out for. I didn’t see much about a text scam, but I knew it could just as easily be done. First off that’s the wrong URL, they spelled it wrongly and your mind doesn’t see it. Its not SSL or HTTPS, and most sites are now a days. Be careful and take a second to check it out before you click!